Jazz, classical, folk and big band … from Hungary: a wild combination that makes for tremendous fun, serious musicianship and thrilling inventiveness. Founded in 2005 and led by Kornel Fekete-Kovacs, trumpeter and composer, the Budapest-based Modern Art Orchestra is a marvel. 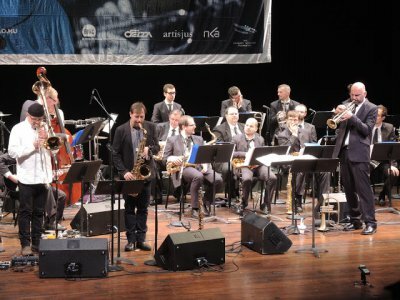 Its twenty musicians – five in the rhythm section (piano, percussion, guitar, double bass) and fifteen on horns of all sorts (saxophones, trombones, tuba, French horn, trumpets and flugelhorn) – form a tight, cohesive group, sharing features of big band brash and a chamber group’s intimate connectedness. Many of the musicians played more than one instrument, even within the span of a single piece; in a few pieces, individual musicians had extended solos. At any given moment, if one or more players weren’t playing, they were watching their colleagues with delight, bobbing the rhythms with their heads and tapping out the complicated syncopations with their feet. Like the musicians, the audience, though seated in formal concert rows, was in constant, unstoppable movement. This was no casual or uninterested listening: the sheer energy of the music pulled listeners into rapt and keen attention. Though the unifying intention and sounds of all the music were distinctively the Modern Art Orchestra’s, each piece was distinctive. The evening opened with an arrangement of Bela Bartok’s Allegro Barbaro, composed by MAO pianist Gabor Subicz. Formal modern classical music was turned into a quick, kicky jazz marked by subtle shifts in tone and nuance between sections. Immediately after this piece, Fekete-Lovacs introduced himself and the orchestra, briefly describing the orchestra’s sense of pleasure in “bring(ing) our music from Hungary to you” and indicating that they were interested in combining traditional classical music, jazz and folk traditions, and in drawing on the skills of orchestra members as composers as well as instrumentalists. The second piece, written by MAO saxophonist Kristof Bacso, The Visitor opened with a lush and ghostly – nearly Romantic – sense of mystery into which the Visitor, a solo trumpet played by Fekete-Lovacs, inserts his message. The trumpet’s message rings out at once clear and untranslatable amidst the regular babble and business of the crowd; the population of musical sounds builds to a grand conclusion of briefly unified notes and rhythms until there is sudden silence, followed by one single, brief note, and then, in the emptiness, the Visitor is gone. The third piece, Tales of Uncle Pepin from the Great Patriotic War, by prominent Hungarian composer Laszlo Melis (b. 1944), had an equally narrative feel to it, together with an evocation of eighteenth century marching tunes and traditional folk material. War ugliness and challenging harmonic dissonances evoke patriotism’s complexities, the unnerving mix of pride and fear, while a trumpet solo carries an individual soldier’s voice, sometimes at one with his comrades and sometimes at odds with them. As the piece progresses, emotions race as all are caught in the now involuntary engagement of combat. As Fekete-Lovacs pointed out, this was only the first movement of The Tales of Uncle Pepin … we can only happily wait until the composer finishes the piece. The next piece, On My Own, composed by pianist Gabor Cseke, was less about jazz – the common vocabulary of many MAO pieces – than classical modernity. The subject here was imagination’s movements from internal introspection to externally explored landscapes; the musical moods included lyrical dreaminess, plaintive blues and, at the end, an assertion that verifiable certainties do indeed exist. The fifth piece, Paris-Dakar, was composed in 2000 by Peter Eotvos (b. 1944), Hungary’s best known contemporary classical composer, and featured Laszlo Goz on solo contrabass trombone. Goz brought forth from this remarkable instrument eerie, breathy and odd sounds, more organic than metal, until it burst into full and urgent participation with the band in a wild, fast urban world of commerce, cross-purpose and competition. It was a tour-de-force of cacophony rendered melodic, chaos controlled – the sounds of a modern city – until that deep, deep trombone was left again in a breath of solitude. 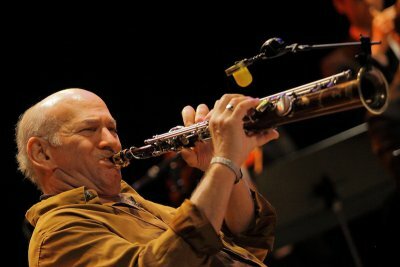 The sixth piece featured saxophonist soloist Dave Liebman. Variations on a Folk Song, the second piece of the evening composed by Kristof Bacso, began with Liebman briefly playing a folk melody on a reedy, wistful recorder, before switching to soprano saxophone. As the band gradually joined in, the music expanded into an orchestral sweep and then ultimately into big band jazz. 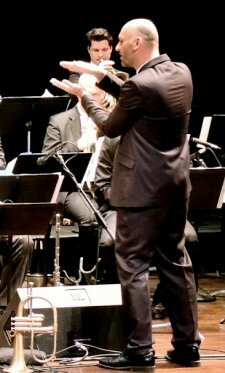 Liebman wove the traditional tunes in and around all the other instruments’ rhythms and melodic lines. By the end, the music was exuberance incarnate. The remaining three pieces were all composed by Fekete-Lovacs and featured Liebman. In each, the core elements of musical conversation and exchange, of creation and especially the creation of fun were at the pulsing center of the works’ intentions and their vocabulary. The final Traffic Choral began sotto voce as Fekete-Lovacs thanked the soloists and introduced each and every member of the orchestra (twenty men, including Fekete-Lovacs himself) and then evolved into a leisurely, sustained conclusion, marked by a brief spotlight moment for each musician – including a spectacular mini-set of Laszlo Csizi on drums and Andras Des on percussion – and a resounding unity of joy. The MAO musicians’ stunning technical virtuosity made big stretches of very difficult music seem almost easy; their individual and collective artistic imaginations give both plausibility and legitimacy to the unlikely project of exploring Hungary’s rich musical heritage by means of a big band collection of instruments. The very sound of the instruments – rhythm and brass – brings with it expectations of big-swing resolution and optimism; the full range of human experience, carried in the melodies of folk tunes, classical composition and jazz, and metered out in the rhythms of modernity, is rendered cosmopolitan and freshly accessible. It is a fine feat. Sponsored by the Balassi Institute of the Hungarian Cultural Center, the Modern Art Orchestra played to a very happy audience. One hopes that these marvelous musicians will soon travel again from Budapest back to the United States. Victoria Bond and Barbara Zinn Krieger’s new opera about Clara and Robert Schumann has the potential to become a powerful story about a woman who seeks control of her own fate. Six hours and twelve choirs singing modern American choral music... an excellent and exhilarating event. A delightful romp through the dancing career of one of Ballet and Broadway’s brightest choreographers.